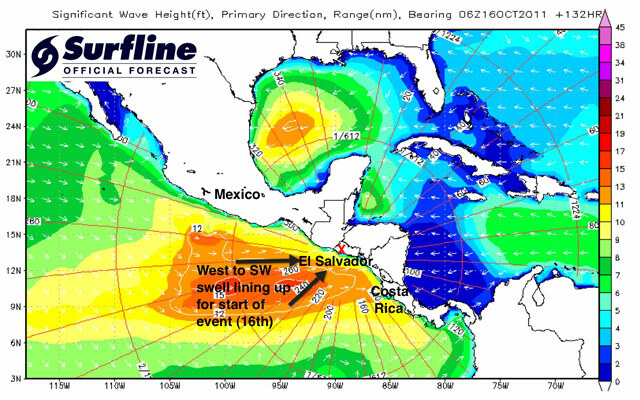 Image above shows the mix of West-SW swells lining up for the start of the event on the 16th of October. BRIEF OVERVIEW: The Eastern Pacific is currently hosting vigorous tropical activity, which will deliver plenty of swell to the region this week and likely for the start of the event on Sunday the 16th into early next week. Joining in for the kick off will also be an easing Southern Hemi SW-SSW groundswell. Conditions are still suspect at this time. Jova/Irwin, in addition to a broad area of low pressure currently about 450nm to the SW of El Salvador (which may develop further over the next couple days), is expected to deliver a decent amount of short to mid period West-SW swell at the start of the event. At this time, the first couple days or so (16th-17th+) is looking quite solid with consistent overhead to 2-3′ overhead+ sets wrapping in at Punta Roca. However, the surf will likely to be a bit unorganized and jumbled due to the close proximity of the swell source, the shorter period West-SW energy with a broad range of 220-270 deg, and variable side to onshore WSW-SW wind. This swell may then drop off rather quickly by Tuesday into the middle of next week (18th-19th), but that will depend greatly on the progress of the offshore tropical activity through the next several days or so. In addition; a southern hemi SW groundswell (215-195 deg) will steadily build in this Thursday, topping out over Friday the 14th before starting it’s downward trend over the weekend and into next week. Although easing by the start of the event, this longer period energy will still deliver chest-head high occasional overhead sets on Sunday the 16th, mixing with the more dominant shorter period swell mentioned above. As we move through the first half of next week, the slow easing SW gradually shifting SSW groundswell (200-190 deg) may linger enough to still provide some fun size waist-chest high+ sets as the shorter period energy drops out and the conditions hopefully clean up some. Beyond that; we may possibly see a new SW groundswell (220-210 deg) move in over the 19th-21st. Although this next potential swell is looking small-scale at this time, it may offer some contestable sets for Punta Roca. Stay tuned as that storm/swell still needs to fully develop. WIND/WEATHER CONDITIONS: October is typically the worst month for weather/wind conditions throughout the region, with heavy rainfall scattered throughout Central America and onshore winds prevailing regularly. In addition, the tropics are very active at the moment with organized systems (Jova and Irwin). Furthermore, we are watching for another possible cyclone that may develop over the next couple days within close proximity to El Salvador. Overall; scattered showers and thunderstorms are expected to continue through at least the next several days for the region. As well, onshore wind episodes can prevail for much of the day, to even all day. Punta Roca will likely be cleanest through the early mornings with side to offshore West-WSW wind. NOTE – Passing showers and thunderstorms will be capable of affecting/switching local wind conditions around. Keep in mind that heavy rainfall will affect road conditions.